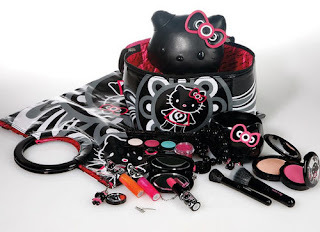 So i succumbed to the Hello Kitty Hype last night and placed an order on Maccosmetics.co.uk. I was originally planning on purchasing much more from the collection but managed to whittle it down somewhat. I also am still in the process of building up my collection and in particular my brush collection. I do have a few brushes from Mac but as they are quite expensive I am only able to slowly build my collection. I have heard mixed reviews about this collection and many people (including myself) have become disheartened with the hype surrounding this particular collection. Another point is that i think the packaging in particular could have been MUCH better. I think they should have stuck to the original Pink and White Hello Kitty colour scheme rather than the Voodoo Kitty Black and Grey packaging they have going on. I'm also aware that there are many dupes available for the majority of the products but to be totally honest, I'm trying as I've said to build my collection so i think its acceptable to buy a few things. I havn't gone too mad and my original list was more or less everything in the collection, but with the long wait and the reviews i have watched on Youtube and read on fellow blogs I have managed to choose the select few products I have bought. I received an email today saying my order has already been dispatched? This is super fast as I only placed my order last night! So are you still excited for Hello Kitty or have you lost interest? Wow, you're so lucky to be able to order your stuff early. Shame they fixed the link.